The last stage in our preparations to launch “Office 365 for Exchange Professionals” on May 4 at the Microsoft Ignite conference has centered on formatting the eBook. Those who buy a copy will be able to download PDF and EPUB versions. The PDF is best if you want to read on a PC while EPUB is supported by iPads and other eBook readers. Word for Windows 2013 does an excellent job of generating PDF output and the only thing we have to check is how the text, graphics, and other elements flow from page to page. For example, it’s generally not good to split a table across two pages or to start a new section a line or two from the bottom of a page. EPUB is a different matter. We generate the EPUB files using Caliber, a really nice open source eBook manager. Some might not like its user interface but I haven’t run into any problems. I like programs that just work and Caliber falls into this category, providing of course that the input you provide is reasonable. We put the Word document through several runs to produce an EPUB file, checking the output each time to detect issues that we had to fix. Here is the list of problems that we encountered. Graphics with bad anchors: Word uses “anchors” to fix where graphics and other objects should appear on a page. Typically you want a graphic to move in line with the text to which it refers and the anchor is usually fixed to the figure caption. However, if you use Word as a simple word processor and only ever create documents of a few pages, you probably have never heard about anchors, nor do you worry about text flowing to the top and bottom of a graphic or around a graphic. Our mixed team of authors had varying degrees of experience with Word and we generated a variety of anchors in different places, many of which were absolutely wrong. You find this out when generating output files as graphics then appear in the strangest of places. The only solution is to go through all the chapters and fix the anchors correctly. Oh, and by the way, always use the Insert Picture command to insert a graphic file (JPEG, BMP, etc.) in Word. You can paste a graphic into Word and this will format and print properly for PDF, but the graphics are likely to be dropped when you generate files in an eBook format. The next thing to avoid are complex tables. Word allows you to get very creative with the way that you layout rows and columns in tables and the colors that are used to highlight table headings and so on. But complex tables have a nasty habit of being thoroughly munged during formatting, so it’s best to stay with simple tables that you can be sure will be supported on an eBook reader. For example, the table shown below has a reasonable chance of surviving the transfer to an eBook. Its sole problem is its width as eBooks tend to be narrower than an A4 or letter-size page. For this reason, narrow tables usually produce better result, so when we go through the book to apply final formatting, we check the width of tables and adjust as necessary. It’s common to construct books from a set of files, each of which is a chapter or other significant section. If you use fields to track figure and table numbers such as Figure 3-1 and Table 7-2, you can run into problems when the time comes to combine everything. It all looks OK when you bring all the files together until you print the file. At that time the fields will be updated and you’ll end up with Figure 3-34 where it should be Figure 3-1. What’s happened here is that all the figures in chapters 1 and 2 have been numbered consecutively so the first figure in chapter 3 starts off at 34 instead of 1. The fix is easy. Select all the text in the document (CTRL/A) and then lock the fields (CTRL-F11). The fields will now maintain whatever value they have and won’t renumber when printing (and outputting to PDF is a form of printing). Fields can be updated selectively by being unlocked (CTRL-Shift-F11) and then updated (F9). During the final formatting of the book, we look through pages to make sure that the layout is attractive. We don’t want tables or code examples to split across pages and it always looks better if a section starts on a fresh page. 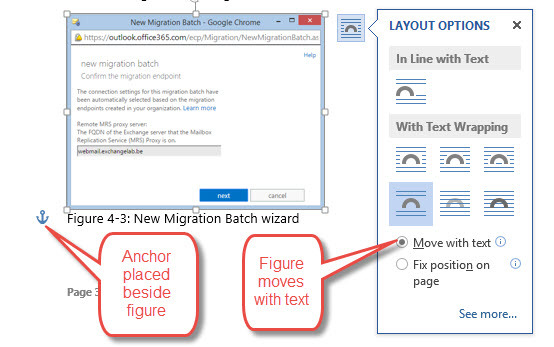 Page breaks are inserted to create the necessary flow and everything looks great in the PDF output. However, those page breaks create a new problem for eBooks because the flow on these devices is more dynamic than in a PDF. We therefore have to remove the page breaks before generating the eBook output files. Fortunately, there’s a reasonably easy way to remove the breaks. In all cases, inserting extra carriage returns to format a document is a bad idea as the extra returns invariably get in the way of formatting. Our book is about Exchange so it is reasonable to anticipate that PowerShell is mentioned frequently. In fact, we have tons of PowerShell examples and have formatted them in 8-point Consolas typeface to clearly identify code. But here’s the thing – most eBook readers are limited to the fonts that they support and all our nicely formatted PowerShell examples that look so well in the PDF file don’t look so well in the EPUB format and look even worse if you output in MOBI (for Amazon Kindle). The newer AMZ3 format supported embedded fonts but, very oddly, you can’t upload AMZ3 files to Amazon’s Kindle Publishing Platform. We’ve played around with various approaches but the PowerShell sample code doesn’t look as well as we want in the EPUB files. I’m sure that it is possible to get around this problem with other tools but we don’t have the time to pursue that option at present. Another route might be to outsource the problem to a company that specializes in preparing output for eBook readers, but the costs of processing a 22MB, 630-page, 240,000-word document with 347 graphics and many PowerShell examples is likely to run into several thousands of dollars. Our EPUB output is not that bad! One thing we did find out and fix is that it is a very bad idea to include PowerShell examples in the format that we use (enclosed in a 1×1 tables to separate them from text) in bulleted lists as extra bullets can appear when the Word document is converted to EPUB. Thanks to Justin Harris for helping us to chase this problem down to a good resolution. These are just some of the issues we have run into in the last week. The good news is that the EPUB output has improved steadily and now looks quite good, especially on an iPad. But it also looks quite good on a PC using the free EPUB reader. We have been asked if we will publish through Amazon in addition to selling books through exchangeserverpro.com. Well, we have done the work to understand the publishing process and what we need to generate both MOBI and AMZ3 format files. Apart from the substantial fees charged by Amazon, we have two major problems to overcome. First, we are not happy with the way that PowerShell code examples are output. That problem might go away when Amazon allow AMZ3 files to be uploaded. The second issue is how Amazon deals with book updates. Given the dynamic nature of Office 365, we have a plan to produce regular updates for the book and are considering September as a good target for the first update. Given the work required to update the content, we would like to charge a fee for the update. We have not settled on the details yet, but those who have purchased a previous version will probably receive a large discount. Amazon doesn’t seem to have a mechanism to allow this to happen. Book updates use a mechanism that is suitable for updates to a novel where you might want to fix some formatting problems or misspellings, but we might want to rewrite large sections to reflect new functionality or information. It seems like the only way to do this on Amazon is to publish a brand new book. 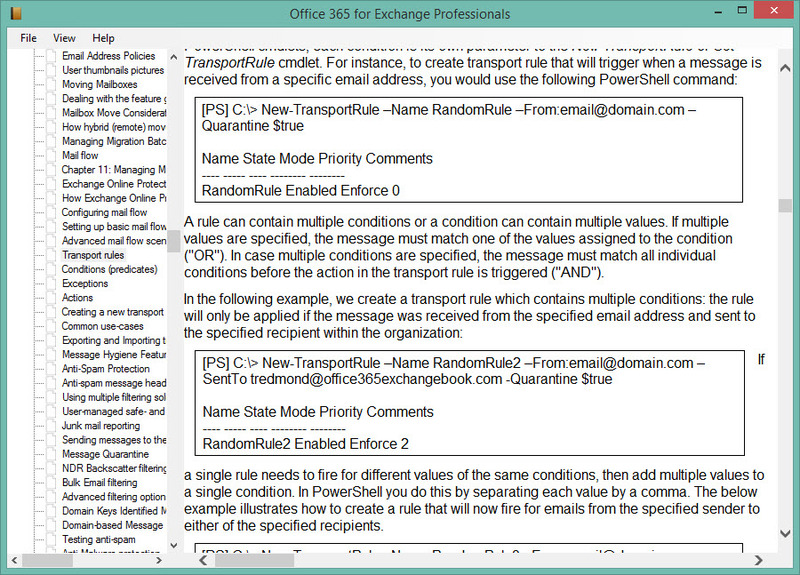 So we would have “Office 365 for Exchange Professionals (May 2015 edition)”, “Office 365 for Exchange Professionals (September 2015 edition), and so on. Pushing out new editions is OK but we wouldn’t be able to offer a discount to those who had bought before. Update (June 2): We have sorted out the Amazon problems (in some degree) and a Kindle version is available at Amazon.com and its country-level stores. It’s not perfect, but life seldom is.. In the interim, we are locked and loaded and ready for May 4. Site subscribers have access to a discounted version of the book now (the files won’t be available until Monday), but if you’re interested, you can head over to exchangeserverpro.com to buy your copy! This entry was posted in Office 365 and tagged Amazon Kindle publishing, eBook formatting, EPUB, MOBI, Office 365 book, Office 365 eBook, Office 365 for Exchange Professionals, Word 2013. Bookmark the permalink.